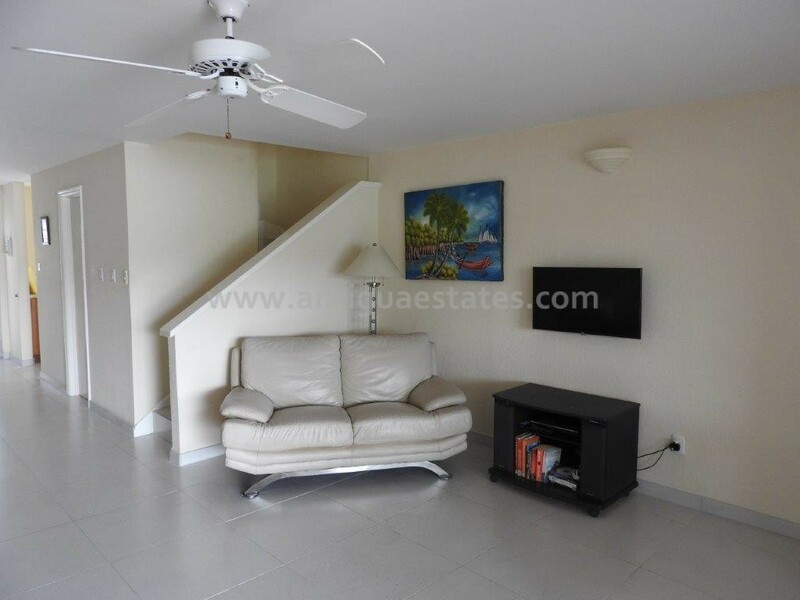 Villa 223B is a nicely presented villa, its interior has a light, airy and modern feel, making excellent use of the cooling breezes from the louvred hurricane shutter front door. 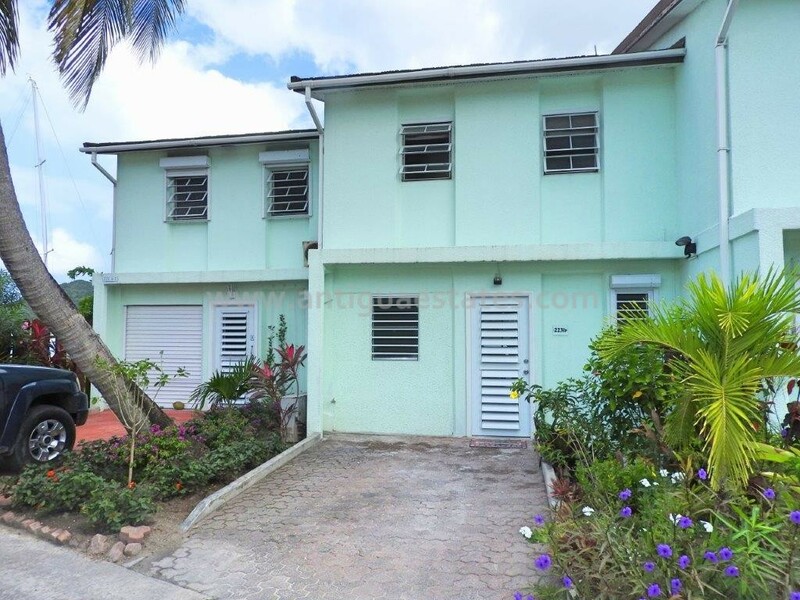 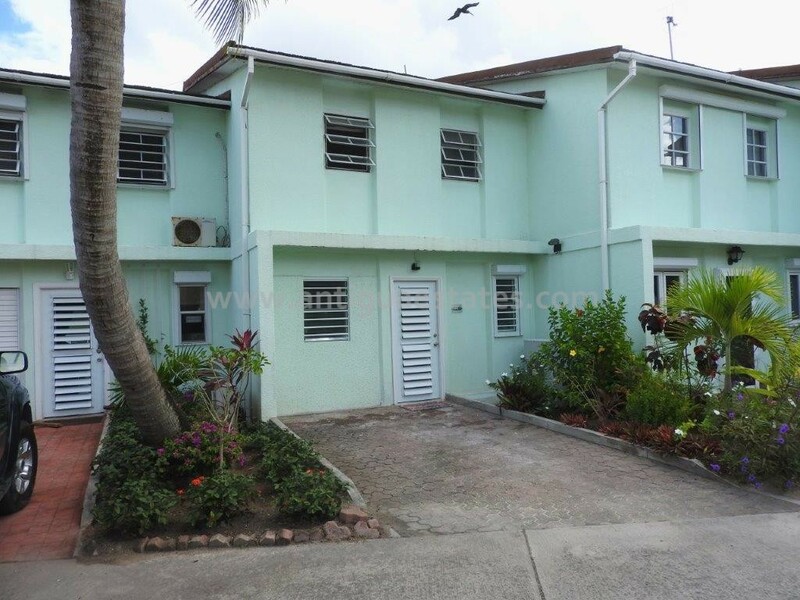 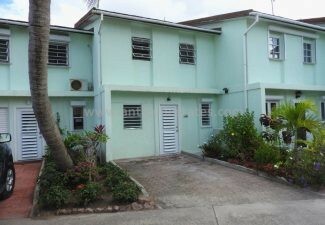 This spacious fully air-conditioned property is only a 3 – 5 minute walk from Jolly Harbour’s white sandy South beach. 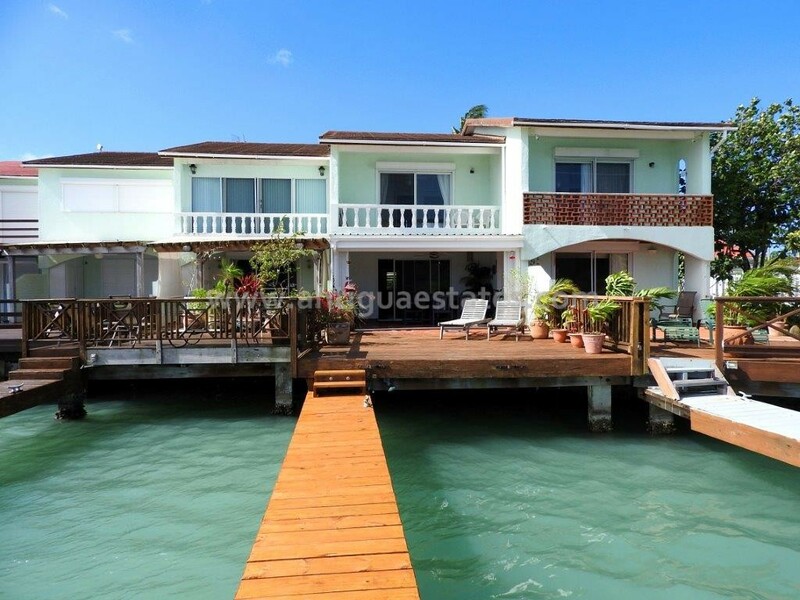 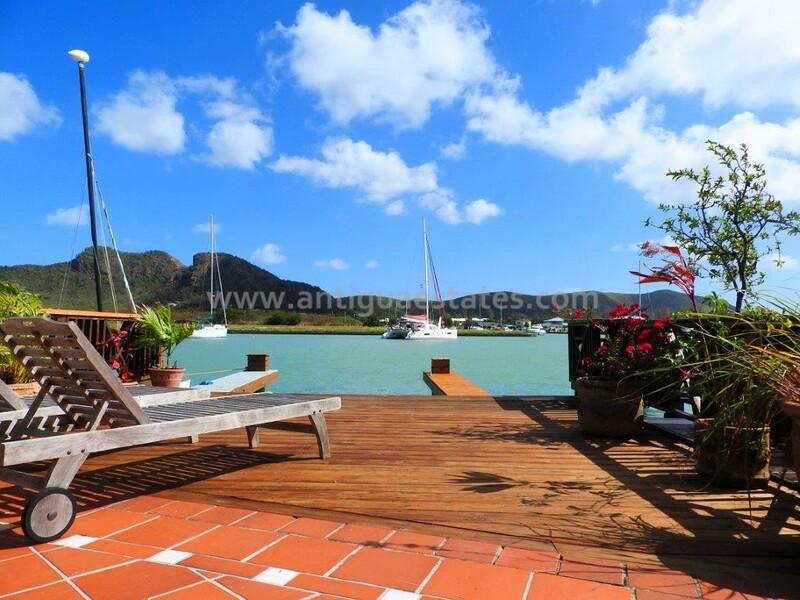 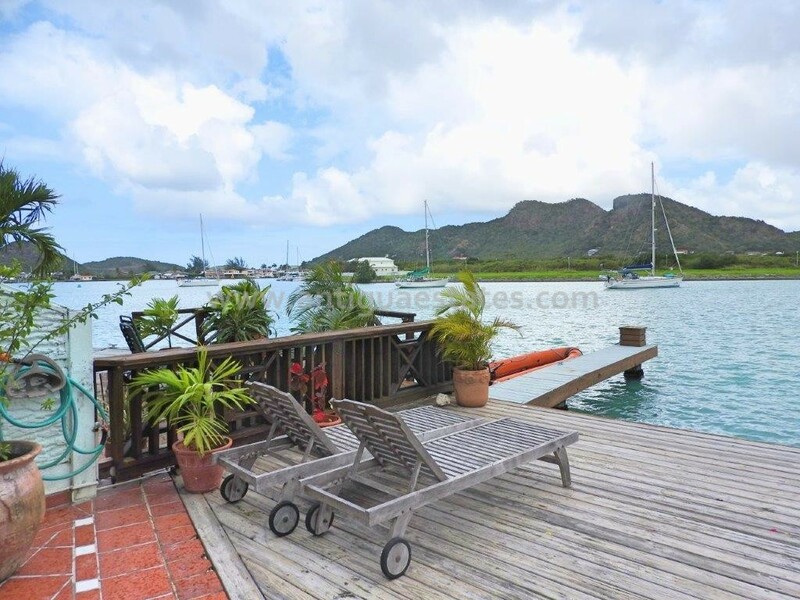 This exceptionally appointed villa is a sailors dream, not only is there no need for air conditioning due to the constant trade-winds, but the depth of the channel here allows for the larger sailing vessels to be manoeuvred and docked with ease! 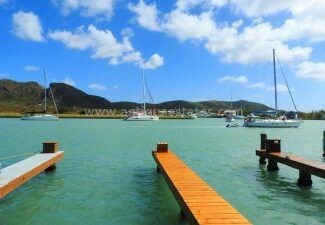 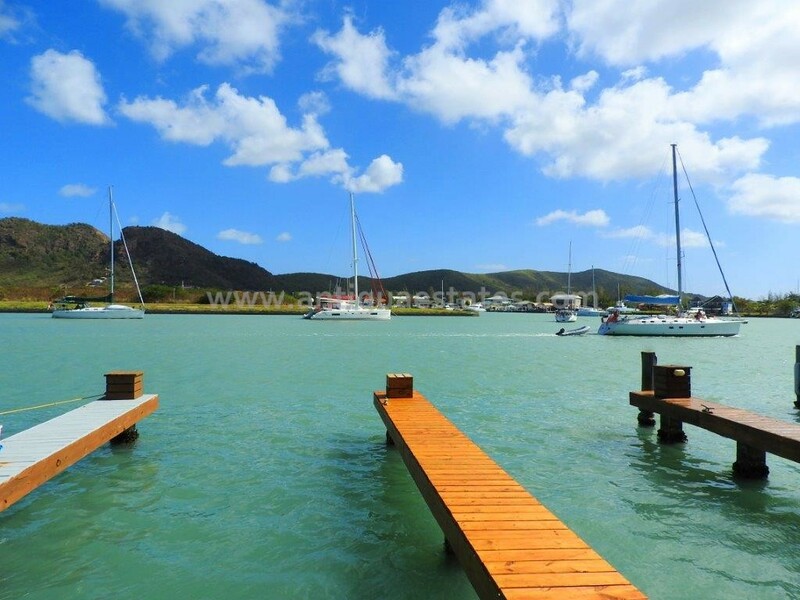 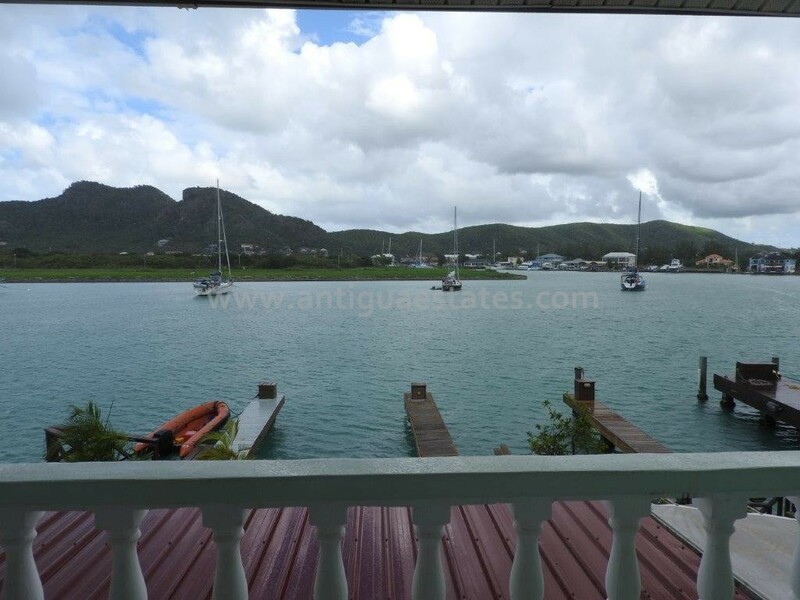 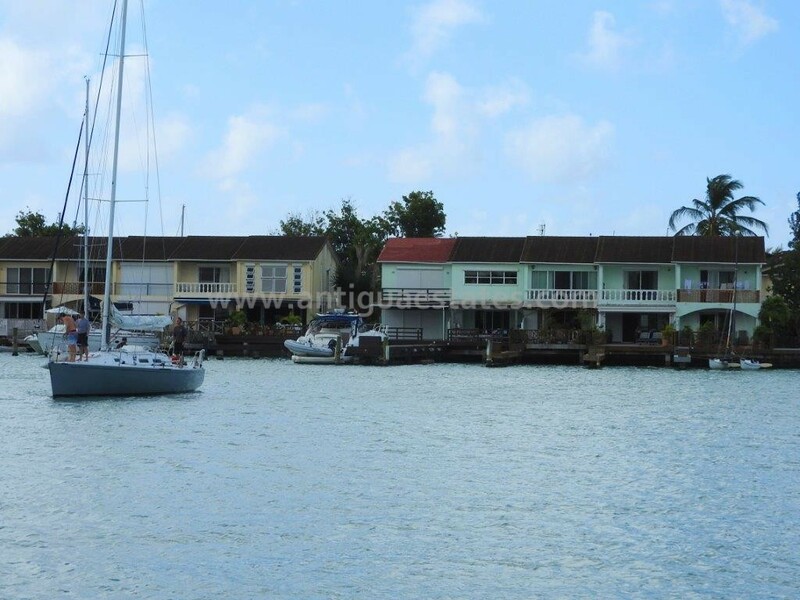 The passing sailboats and ever changing vista make this location one of the most desired in the south finger of Jolly Harbour. 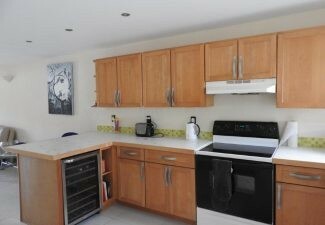 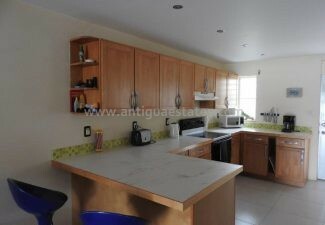 It has a modern kitchen, with all up to date appliances including a wine cooler. 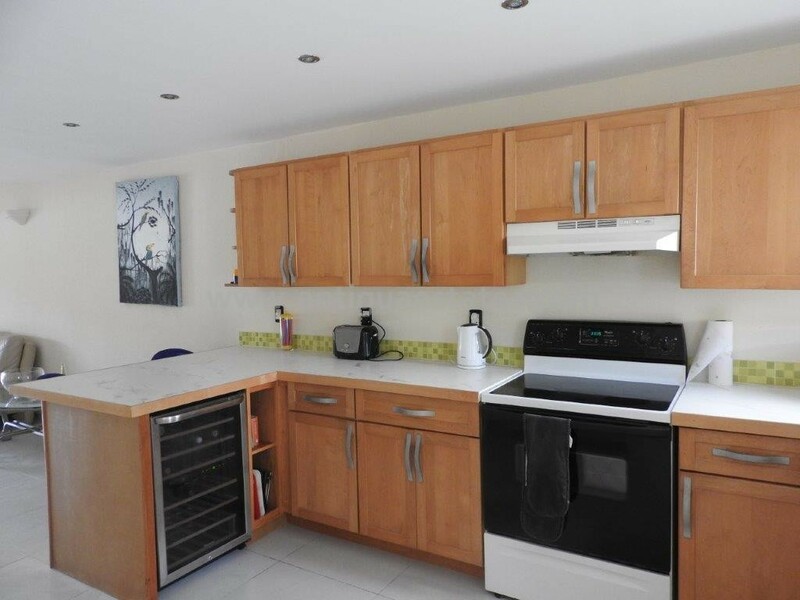 The garage space has been cleverly utilised to house the washing machine, fridge freezer and serviced large capacity cystern tank. 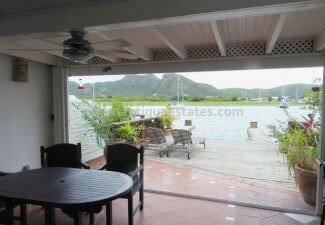 The security window allows both breeze and light to flood this area. 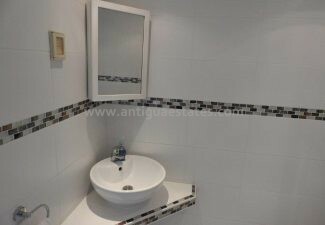 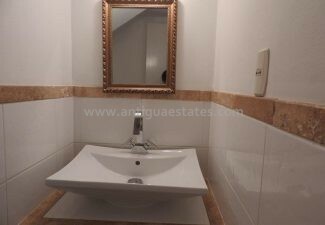 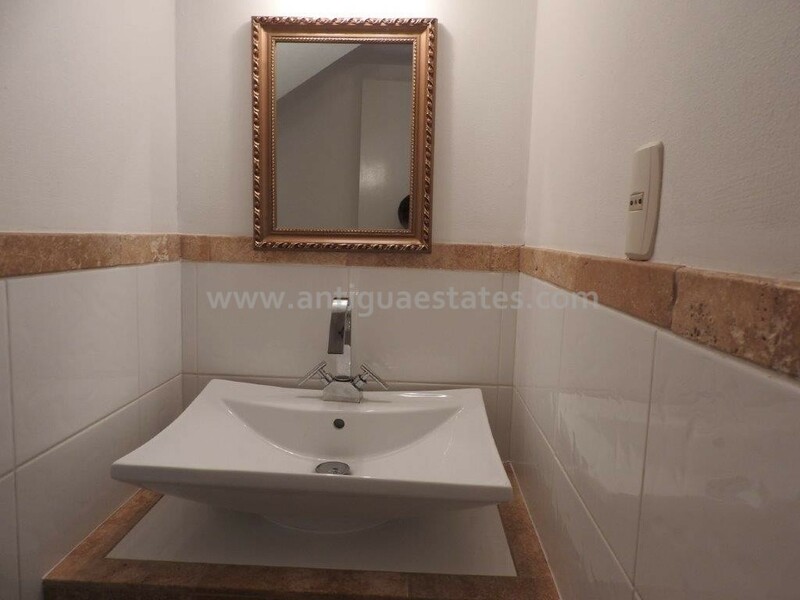 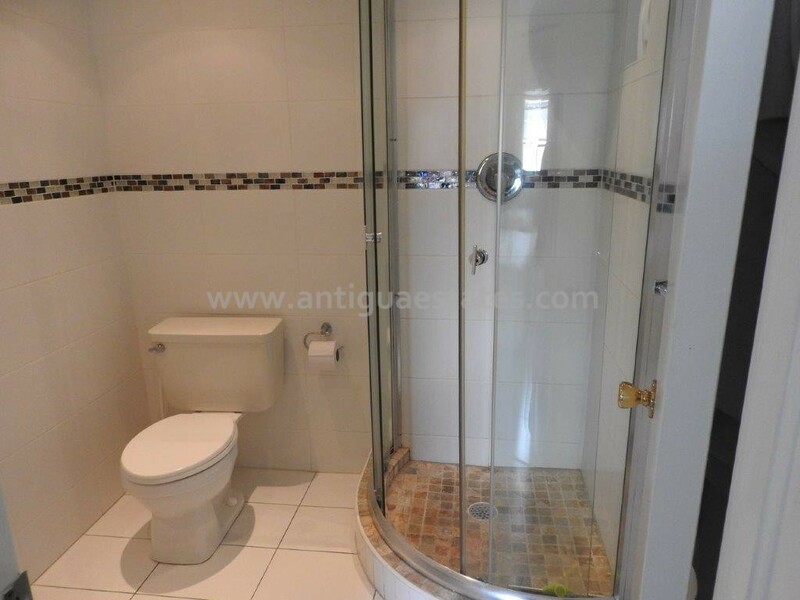 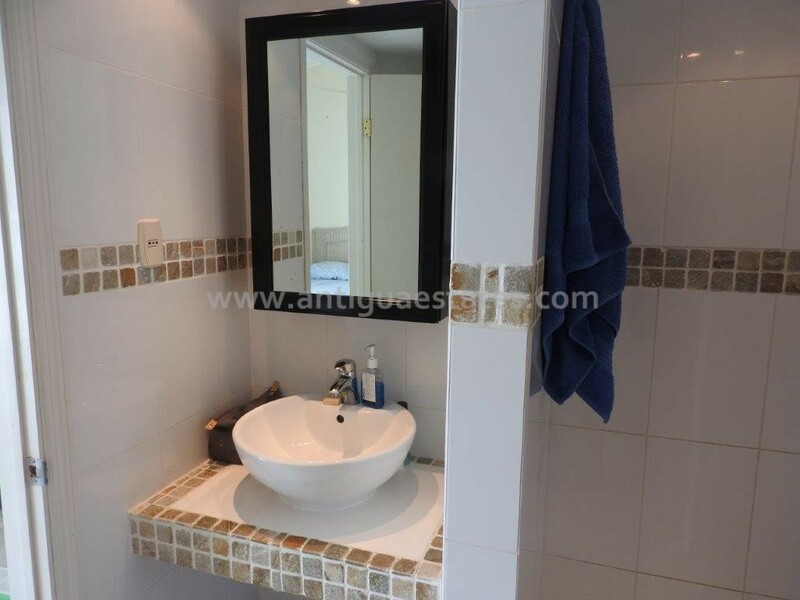 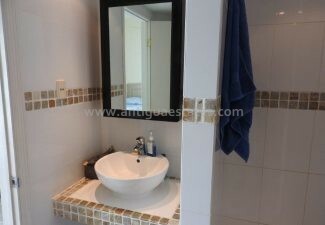 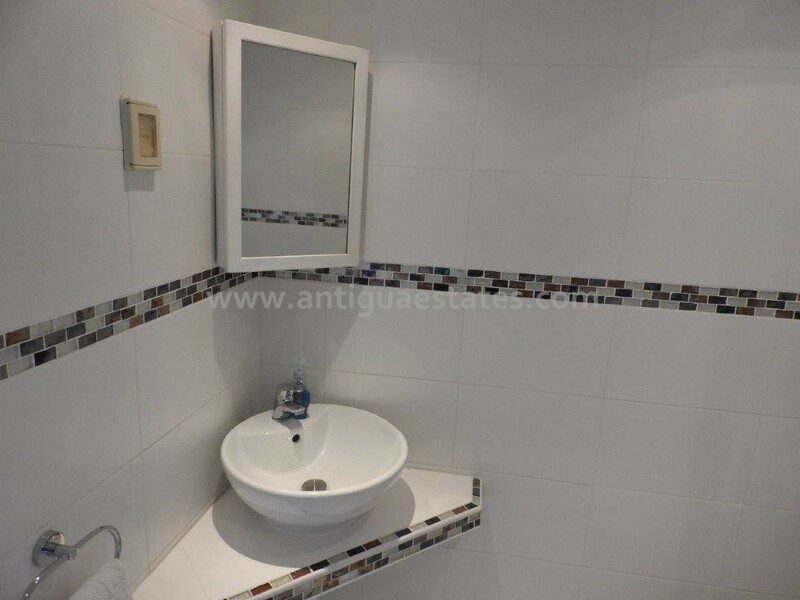 The downstairs WC is in a contemporary crisp white, with coordinating modern wall tiles. 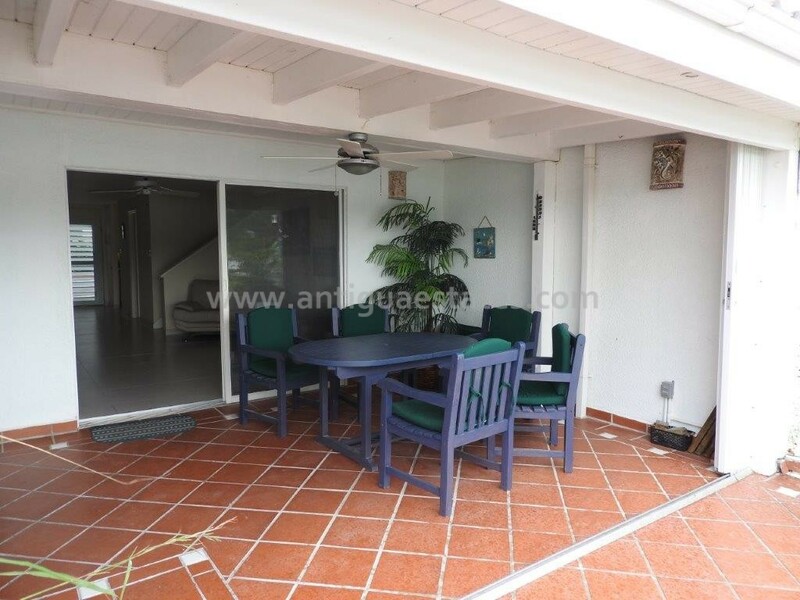 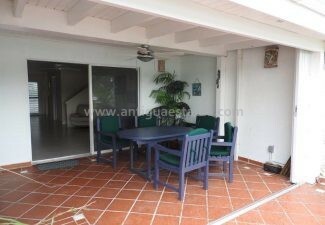 The spacious, relaxing lounge area leads out to the covered sundeck, complete with hurricane shutters, fan and a bbq, for that wonderful al fresco dining experience. 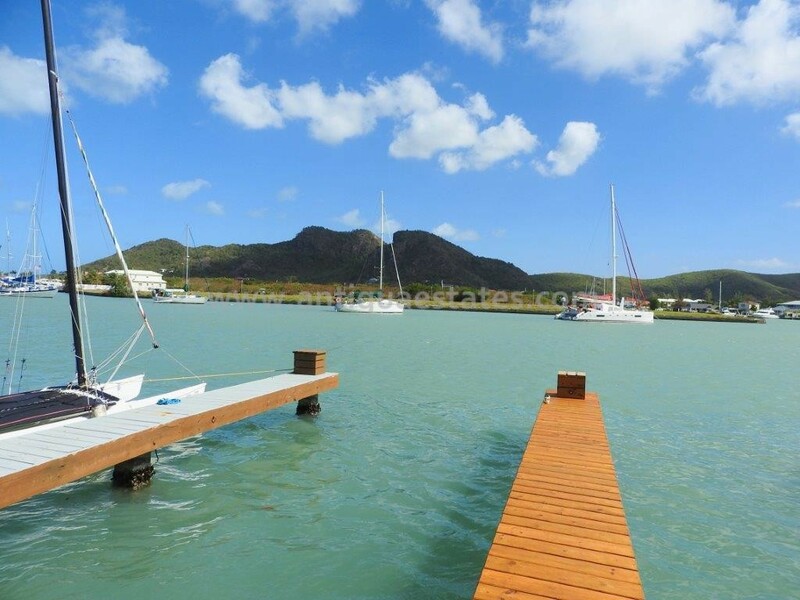 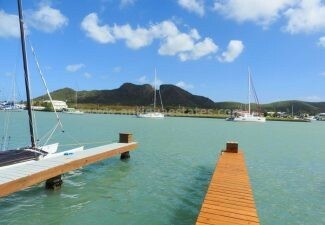 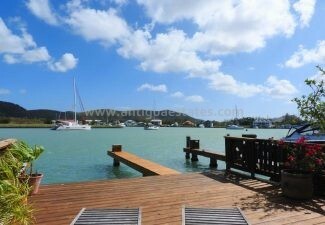 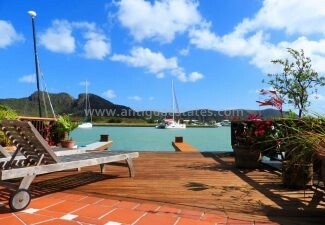 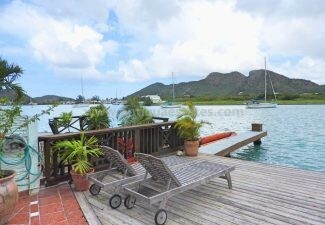 There is also an extended deck area with sun loungers for soaking up the caribbean sunshine while relaxing looking out over the marina. 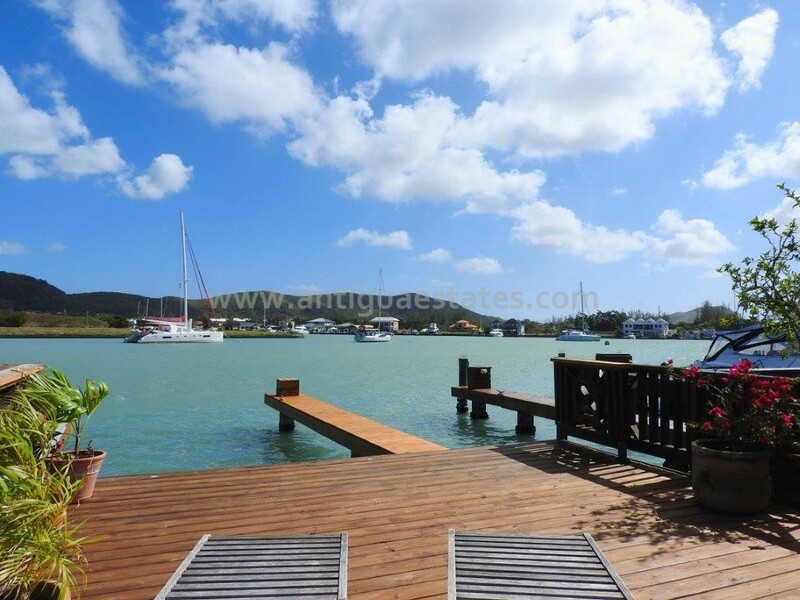 The finger pier has space to moor a boat of up to 40ft in length. 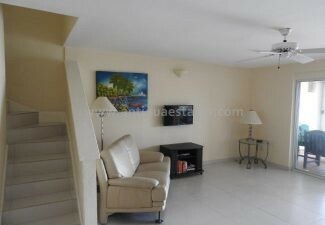 From the lounge, a stairway leads to the two bedrooms, both with modern, contemporary en suite bathrooms. 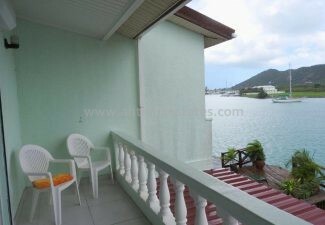 The master bedroom boasts a king sized bed and captures amazing views from the gallery down through the harbour and beyond. 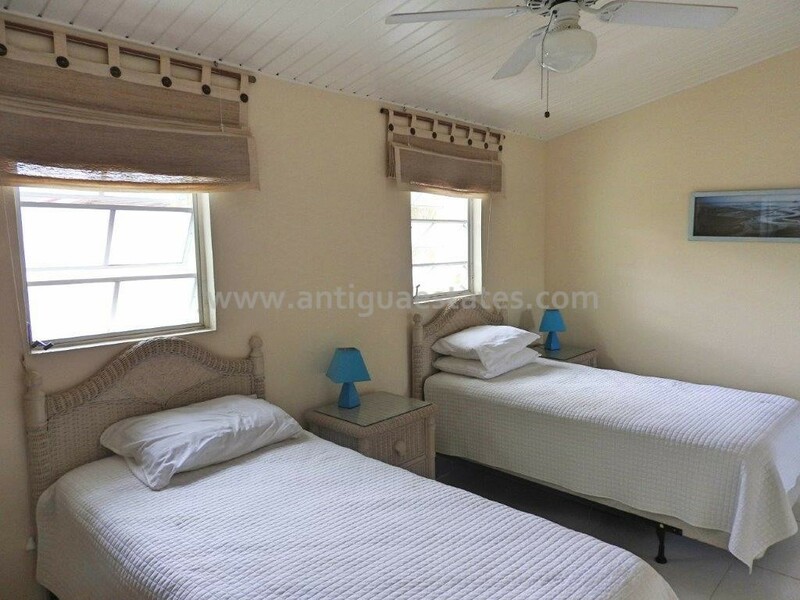 The second bedroom has two twin beds, both bedrooms have ample storage space and sliding closet doors. 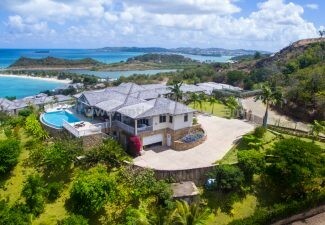 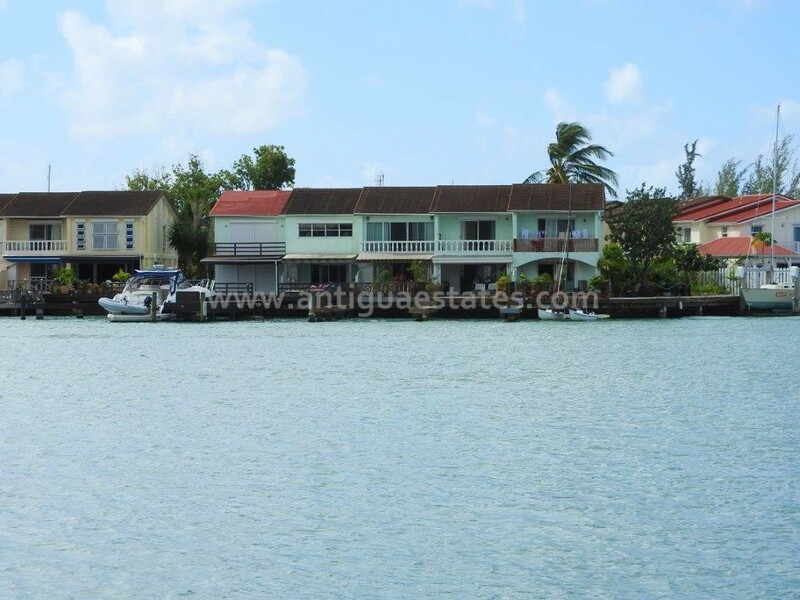 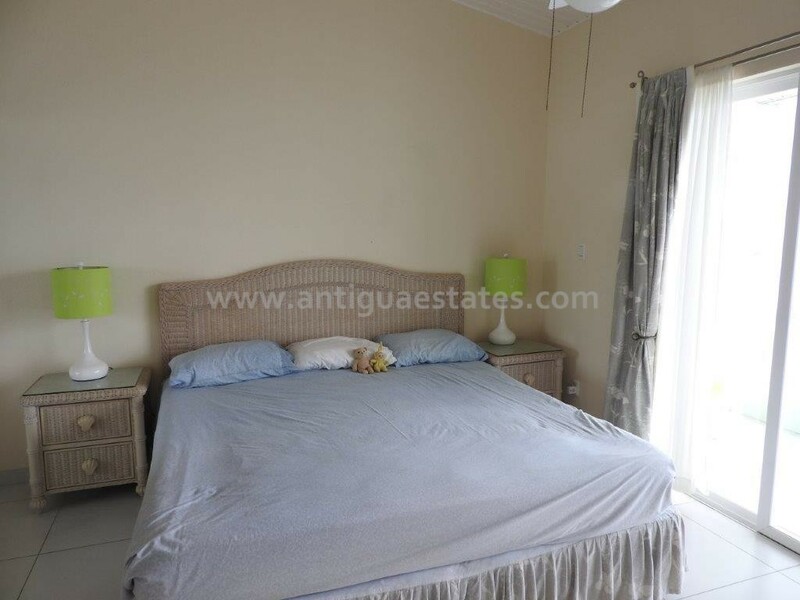 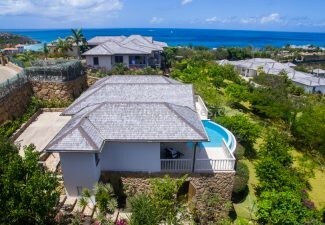 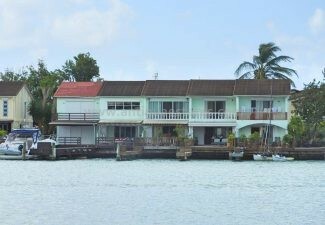 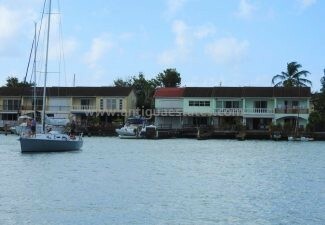 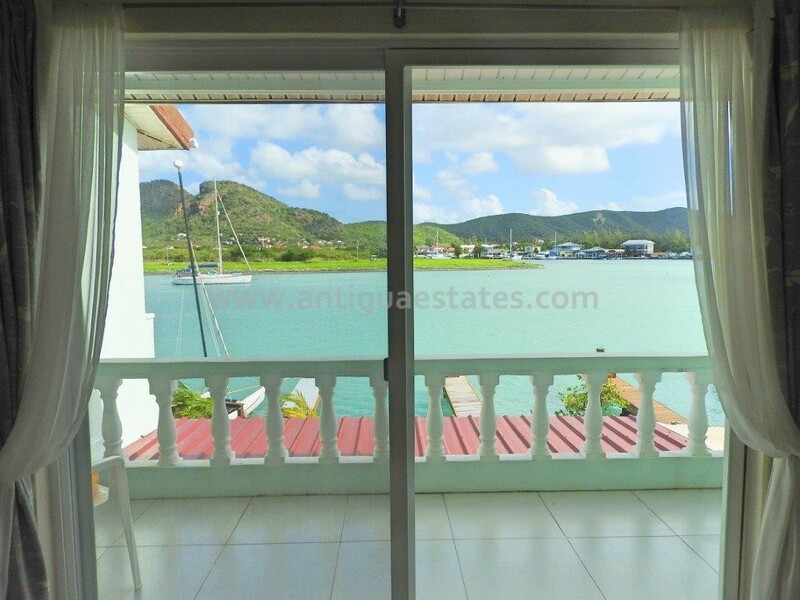 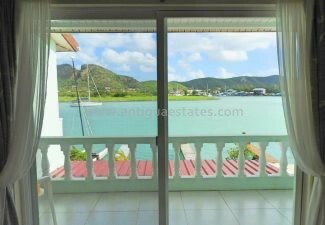 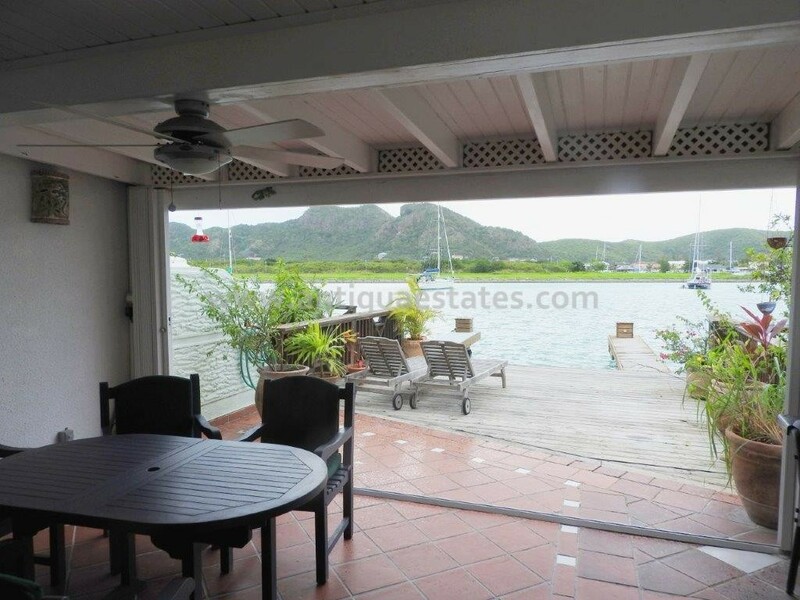 Villa 223B is situated on the South Finger of Jolly Harbour and is only a short walking distance to the fabulous south beach. 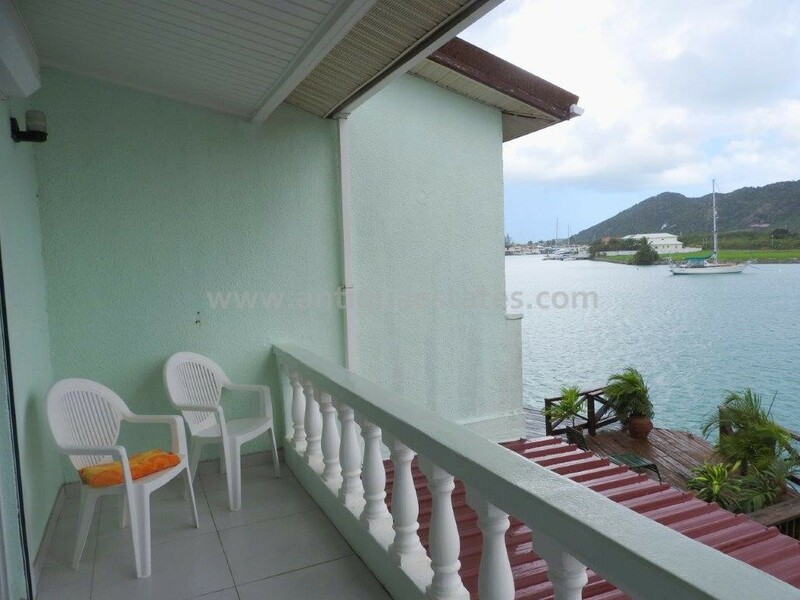 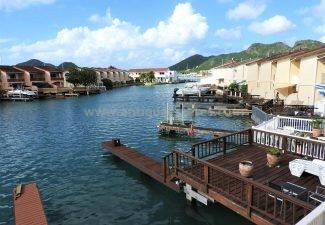 The property is set within the popular gated and secure Jolly Harbour resort which boasts the biggest Marina in the Caribbean and a fine 18-hole golf course, use of all the facilities at the commercial centre include the large swimming pool, squash and tennis courts and an abundance of shops which include; supermarket, bank, pharmacy and of course an array of bars and restaurants. 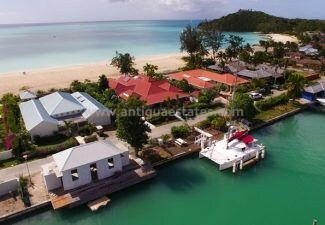 Jolly Beach which is on the south finger is one of the finest beaches set along the west coast of the island which also offers all water sports and a Caribbean beach bar to take in the sunsets.